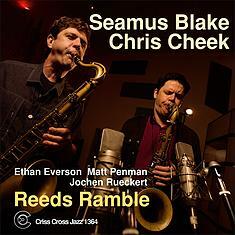 Fellow saxophonists Seamus Blake and Chris Cheek have thrived as leaders, sidemen, big band soloists and much else, contributing to the creative health of the jazz scene over the last 20 years. As a pair they worked on the exploratory groove-oriented project The Bloomdaddies (Criss 1110) back in 1995. But with Reeds Ramble Blake and Cheek reunite in an acoustic setting, buoyed by the extraordinary Ethan Iverson of The Bad Plus on piano, making his first Criss Cross appearance. Drummer Jochen Rueckert, too makes his first label appearance, teaming up with in-demand bassist Matt Penman, a valued presence on Criss Cross sessions led by Jonathan Kreisberg, John Ellis and Zach Brock. The two tenors showcase their distinctive voices on a set of material written by themselves as well as Elmo Hope, Jim Beard, Chico Buarque, Brian Wilson and more. With their subtle orchestrations, bold and unpredictable communication and all-around swinging, bluesy feel, Blake and Cheek continue the tradition of Inspired tenor summits while asserting a sound all their own.